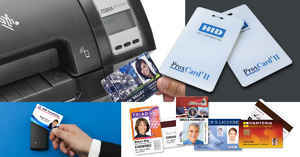 Most businesses and enterprises printing ID Cards are concerned about security at some level. What do we mean when we talk about “ID Card security”? Card issuers primarily want to protect identification, proximity and smart cards from fraudulent use and counterfeiting. ID card security features and technologies are designed to discourage fraud and misuse of ID cards. When a card is issued the issuer wants to ensure the card is used by the actual person to whom it is issued for the purposes it is issued. Issuers don’t want cards to be used by anyone other than the cardholder, or for unauthorized purposes. The consequences of misuse can be significant and costly. Security features help ensure that the person using the card is the cardholder and that the card is used for an intended purpose. This limits organizational risk and enhances operational and financial control. Basic Visual Security – Photos are a basic but effective security device. Photo IDs offer more security than ID cards without photos. A photo offers instant visual verification of cardholder identity–a simple but accurate security mechanism. 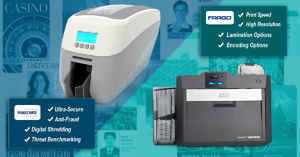 ID Card printers with higher resolution photo printing capabilities offer better security. And don’t forget signatures and fingerprints, which can be added as image files. Barcodes – Barcodes are a security device. A simple barcode can be printed on the face of an ID card, which can be scanned to verify pertinent details about the holder. Lower Security Magnetic Stripes – Magnetic stripes are a security device too. Magnetic stripes are encoded with information (alphanumeric data) when the card is printed. A magnetic stripe enhances security by providing additional details about the cardholder subject to confirmation or verification when the card is “swiped” through a reader. The amount of data that can be encoded onto a magnetic stripe is limited. Medium Security Access/Smart Cards – Smart Cards offer a higher level of security because they allow more detailed information to be stored digitally directly on the card, and can only be “read” by a digital device (reader). These feature an embedded microchip within the card layers that allows large amount of data storage. Proximity cardsuse contactless integrated-circuit technology to transmit security or payment data from a distance–without physical card swiping–while remaining totally secure. A microprocessor chip embedded within the card layers is read via radio signals rather than physical contact. 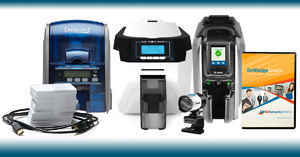 ID card printers with smart card encoding capability encode smart cards during the printing process. Higher Security Holograms – High-security holograms (aka overlaminate holographics) are difficult to forge, yet easy to authenticate. Holographic overlaminates can be bought off-the-shelf or custom designed. 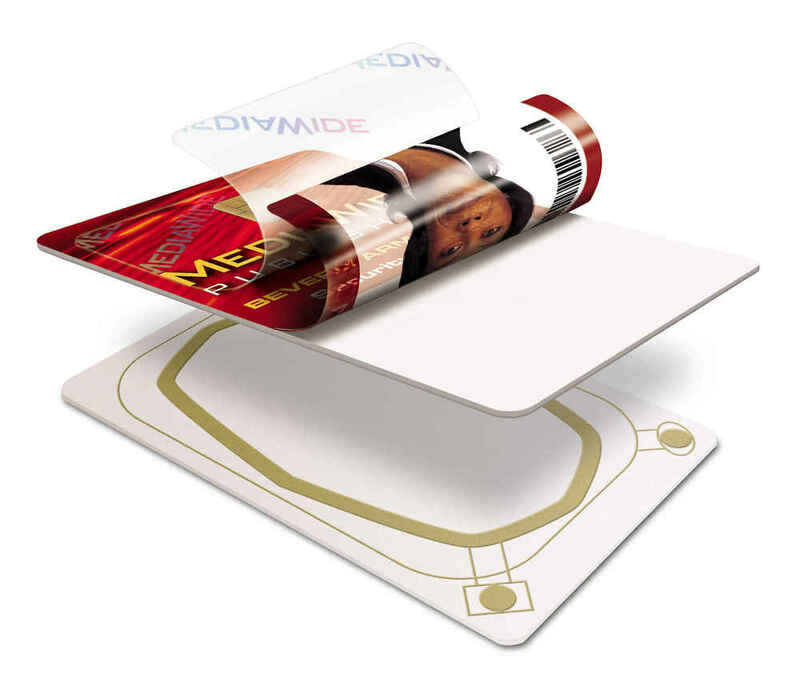 Custom-designed holographic overlaminates offer the greatest security to your ID cards and badges via a special protective film overlay process. A custom film is uniquely designed for your company's requirements and registered as yours alone. No other hologram is like it. Simpler holographic foils and images–like those on credit cards–are also available as a security device. These are usually applied to a card’s surface and can be applied in the shape of a company logo or any other image unique to the organization. They cannot accurately be reproduced. Highly Secure Card Design – Card design itself offers a basic level of security. 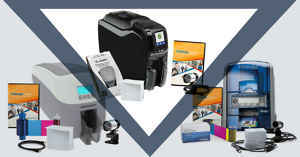 Your ID card printing software can permit the creation unique, complex, and difficult to duplicate custom designs for your ID cards, especially background layouts, which makes counterfeiting much more difficult. These designs are virtually impossible to reproduce by copy machine or re-create digitally. Replicating a unique background design can be a strong barrier. These card-design capabilities permit you to choose from watermarks, fine lines, cameo effects or even micro-text (super small text that can only be read with a microscope or magnifying glass, and typically features an intentional misspelling or transposed characters). 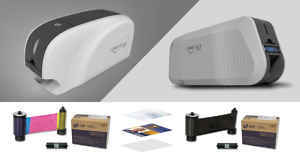 Generally, the more sophisticated the security features you seek, the more expensive your ID card printer will be. We’ll review additional ID card security features in upcoming posts.